Many of us are rediscovering the pleasures and health benefits of walking and hiking. Why is walking so wonderful? Walking is free, and suitable for people of all ages and most abilities. Walking is gentle, low-impact and a great way to free your mind from the stress of the day. Walking can be emotionally therapeutic and spiritual. For example, Buddhists perform walking meditations. Recent research reveals less than half of U.S. adults get the recommended amount of physical activity. The Mayo clinic recommends adults need at least 150 minutes a week of aerobic physical activity. Walking should be at a moderate level, such as a fast-paced walk, for no less than 10 minutes at a time for best results. *Keeps weight in check—to lose weight, you need to burn about 600 calories a day more than you’re eating. An individual burns about 75 calories simply by strolling at 2 mph pace for 30 minutes. If you increase this to 3 mph, you will burn 99 calories, speed it up to a fast walk (4 mph) and that’s 150 calories. *Lowers disease risk and can slash risk of developing type 2 diabetes, asthma and some cancers. 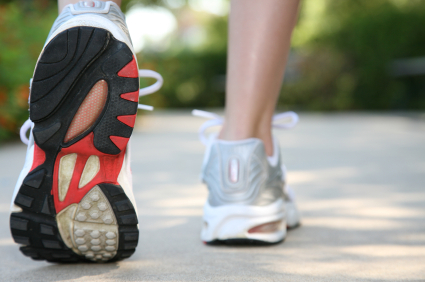 The British Medical Journal reports taking more steps every day can help ward off diabetes. Active walkers have about a 20 percent lower risk of developing chronic disease such as cancer. *Strengthens your heart, reduces the risk of heart disease and stroke, lowers levels of LDL (bad) cholesterol and increases levels of HDL (good) cholesterol. Keeps blood pressure in check. Brisk walking for 30 minutes helps prevent and control high blood pressure, thus reducing stroke risk by up to 27 per cent according to the Stroke Association. *Helps preserve skeletal integrity. Walking counts as a weight-bearing activity that stimulates the building of healthy bone and the maintenance of healthy joints. *Tones legs, bum, and core muscles. If you really focus on posture as you walk, it can tone your abdominal muscles and your midsection. *Tones arms. Walking speed is determined by the action of your arms, so hold your arms at a comfortable level, bent at the elbow, and swing them backwards and forwards as you walk. When you swing them faster you automatically speed up, toning arms, shoulders and upper back. *Walking outside in daylight boosts the body’s vitamin D stores. This in turn plays an important role in bone health and immunity. *Increases energy by increasing blood circulation and oxygen supply to every cell in the body. This eases stiff joints and muscle tension. A lunchtime walk is a quick way to boost energy levels for the afternoon. *Exercise boosts mood by releasing feel-good endorphins into the bloodstream. Studies show regular moderate-intensity exercise such as walking briskly is as effective as antidepressants for mild to moderate depression. The Mayo Clinic recommends walking as a great way to get and stay fit, but asks if you doing enough to see results. Using an activity-tracking app or a pedometer can help you set and reach fitness goals by increasing motivation. Some “walking apps” can connect you to online walking communities for support and a sense of competition. It’s easy to start walking to a healthier you! All you need is a good pair of shoes, comfortable clothing, and a positive outlook. Just walk out the door and start out slow and easy. Walk for 10 minutes, and walk back. Soak up the sunshine and breathe deeply. If possible walk where there are few automobiles to avoid stress, noise and pollution. If you have health concerns, start out with a few minutes at an easy pace, and slowly increase distance and pace over time. For fun and fitness join a walking club. The easiest way to get started and to stay on track is to seek out an existing group close to home, such as a YMCA, community center, or a lunchtime group at your work place. The leader should encourage post-walk stretches and set a healthy pace. Workplace walking groups not only promote mental and physical fitness but also increase morale. Facebook is a great place to start a group, find members, post comments and pictures, share walking sites, and list times. You need to find people who are already walking or who are as excited as you are. To maintain motivation, partners need to be well matched. Try to match the age range or skill level so no one feels out of place. Walking and biking vacations have always been popular. Expanding beyond the US National Park system, many states and cities are establishing designated walking/biking trails that are designed for the needs of all fitness levels from the disabled to the casual walker to the practiced hiker. Spring is in full swing, and the timing couldn’t be better. Go for it!